PartitionGuru Pro (старое название DiskGenius, под этим именем продолжает выпускаться китайский вариант программы) - мощный инструмент для управления разделами на жестком диске, может создавать, удалять, скрывать, форматировать, изменять размеры разделов и восстановить утраченные таблицы разделов и создавать/восстанавливать бэкапы. Позволяет вам настраивать каждый параметр в таблице разделов. Кроме того, PartitionGuru предоставляет ряд других полезных функций, такие, как: резервное копирования таблицы разделов, восстановление MBR (Master Boot Record) и многое, многое другое. • проверка разделов на ошибки. 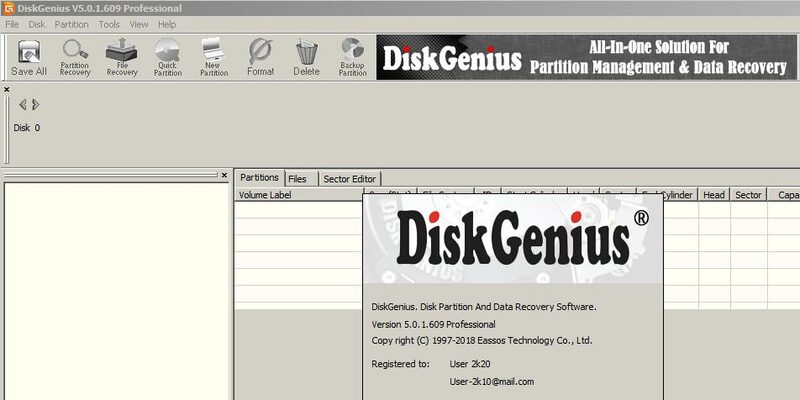 PartitionGuru (DiskGenius) Pro - All-inclusive partition manager program to safely resize partitions, recover lost files, edit hex data and back up data for PCs, laptops and workstations. - More powerful features are available for professionals. 1. Optimize file recovery feature for EXT4 partition. 2. Optimize file recovery function for NTFS partition. 4. Improve response speed to damaged disk in some cases. 1. Fixed a bug that exceptions might occur when partition recovery function ignored a partition. 2. Fixed an issue that files were not completely listed when recovering files from FAT partition. 3. Fixed a bug that progress bar couldn't be stopped when registering application without connecting to the Internet. 4. Fixed an issue that in some situations MBR created by Quick Partition was not correct. 5. Fixed a bug that in rare cases the unformatted partition was not displayed after being resized. 6. Fixed an issue that operating system cloned from FAT16/FAT32 system partition might not be able to boot.